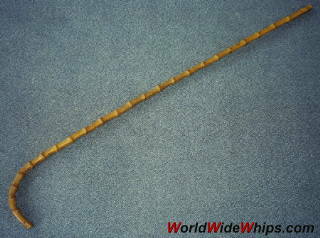 This Whangee cane once belonged to an English boarding school teacher. Despite its look this is no slapstick movie prop, but a serious punishment item, used as "ultima ratio" when the rattan cane failed. The crook handle opened during the years. Maybe I fix it by steaming and re-bending.